There is a long standing theory that when the incoming tide approaches the St.Helen’s ground in Swansea, the ball will swing. And although both teams wanted to bat first, the Derbyshire seamers also took full advantage of the muggy conditions to reduce Glamorgan to 52 for 5 after 21 overs of the first session. They recovered after tea, thanks to Chris Cooke’s 69, and closed on 175 for 7. Play did not get under way until 3.40 after water had seeped under the runups at both ends, and with 46 overs remaining, Glamorgan made a solid start before five wickets fell for the addition of only 25 runs. Nick Selman and Jack Murphy had put on 27, before Murphy edged to second slip, then Selman, in the following over, was leg before, playing across the line to Duanne Olivier. Tony Palladino took the next two wickets, when Owen Morgan nicked one to the wicketkeeper, and Usman Kahwaja, playing his first home game, deflected the ball via his pad onto the stumps. In the penultimate over before tea Kiran Carlson was dismissed by a beauty from Ravi Rampaul, that pitched on middle and leg before moving off the pitch before taking the edge and caught at second slip. After tea, Chris Cooke and David Lloyd counter attacked effectively by more than doubling the score, with both batsmen striking three boundaries in overs from Palladino and Rampaul. The sixth wicket pair had put on 58 in 11.2 overs before Lloyd, played a loose drive against Rampaul and was caught by Gary Wilson. 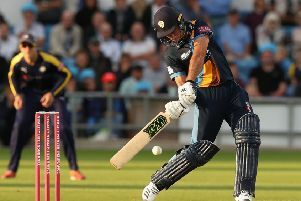 Cooke continued to attack, reaching his fifty from 51 balls which included nine fours, and without his contribution, Glamorgan would have been in a sorry state. The new batsman, Prem Sisodya (19), is making his championship debut, after coming through the Glamorgan Academy and touring New Zealand with the England Under 19 team last winter, and after striking two boundaries, stayed with Salter until the end.